To bring down the level of Fraud on Credit Cards Transactions in India, India’s most efficient regulator of the banking system RBI adopted global practice of 2nd Password Authentication of all Credit Card Transactions done on the Internet / Mobile Platforms. Today we’d like to demonstrate on how to sign-up and register your second password with Kotak Credit Cards Verified By Visa so that your e-commerce transactions occur as smoothly as possible. Finding the sign-up link within the Kotak Online Banking interface itself is tricky, so Kotak customers can directly go here and start the sign-up process. Accept the agreement, you have no choice, but to accept it. After You accept the agreement, you will be taken to the screen as shown below and prompted to enter your Credit Card Details and Date of Birth to identify you are the right person registering for the service. In the third Step, you’ll be prompted to choose your own 6 Letter Password as shown below. The OTP will be a total of 12 characters. The first part of the Password is the 6 characters as entered by you online and the second part is the 6 characters which we will generate and send to your registered Mobile number and E-mail, after you click on submit. We find this, albeit complicate but the most secure way to Register since the second half of Password is sent to your Mobile Number registered with the bank, a tamper proof way to accomplish registration. 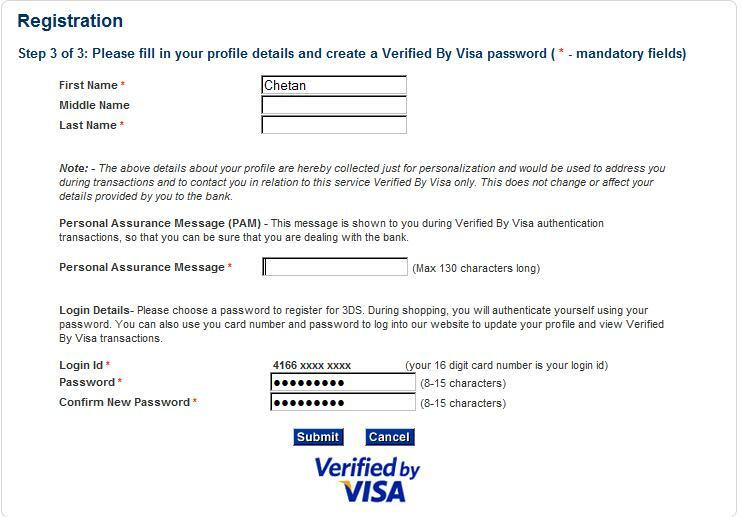 about your profile are hereby collected just for personalization and would be used to address you during transactions and to contact you in relation to this service Verified By Visa only. This does not change or affect your details provided by you to the bank. Personal Assurance Message – This message is shown to you during Verified By Visa authentication transactions, so that you can be sure that you are dealing with the bank. Choose a new password – Please choose a password to register for 3DS. 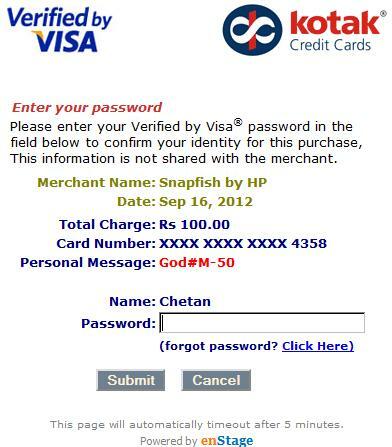 During shopping, you will authenticate yourself using your password. You can also use you card number and password to log into our website to update your profile and view Verified By Visa transactions. 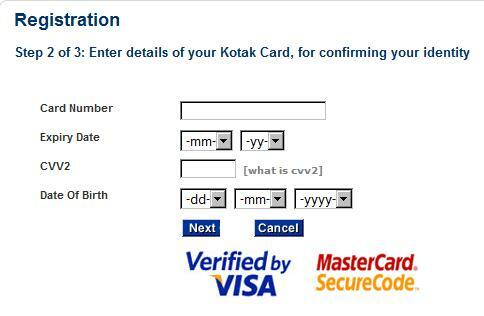 Congratulations you have successfully registered for Kotak Cards Secure Internet Payment. You can now shop online in complete security using Kotak Mahindra Bank Secure Internet Payment.You can also use your card number and password to log into our website and update/view your profile. If you have any queries, please call customer contact centre (8 AM – 8 PM) on 1800 102 6022 or any of the local numbers mentioned in the “Contact Us” section of our website, www.kotakcards.com. You can also write to them by using the “Email Us” option. 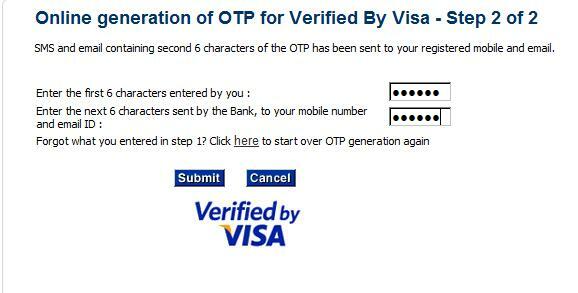 Where to Enter this Password During Online Transaction? Thus I now enter the password for VBV created in Step-4 and complete my transaction. Simple and easy isn’t it ? Any Questions or Suggestions to improve this process are most welcome. This entry was posted on Tuesday, November 13th, 2012 at 12:11 pm	and is filed under India Credit Card Help Guide.